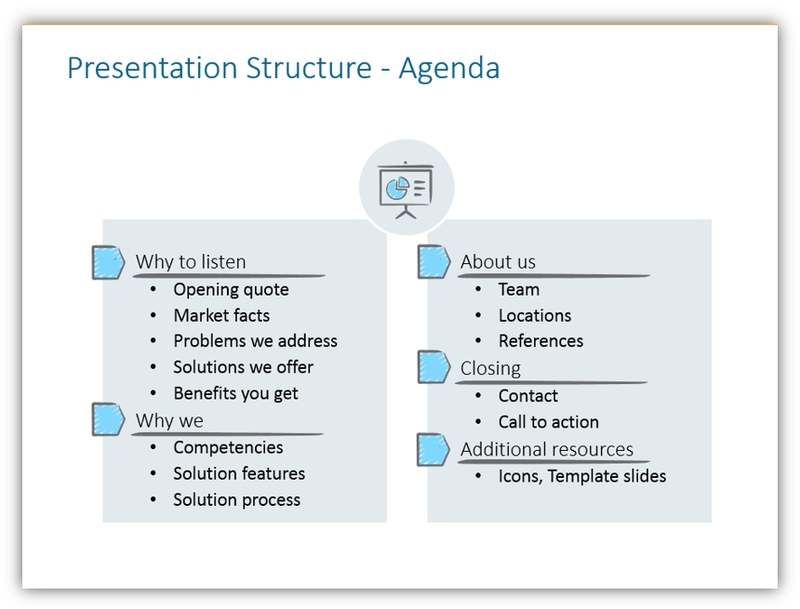 Need to present your company pitch and your solution? Presenting What and Why you do what you do is a common part of business conferences or partner meetings. The trick is how to make it persuasive and attractive. 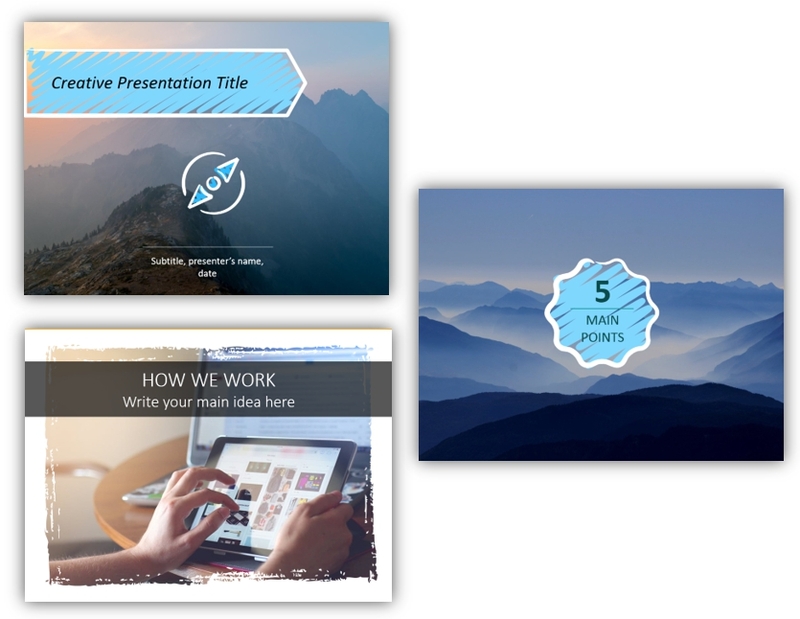 See our tips on how to design creative company presentation. 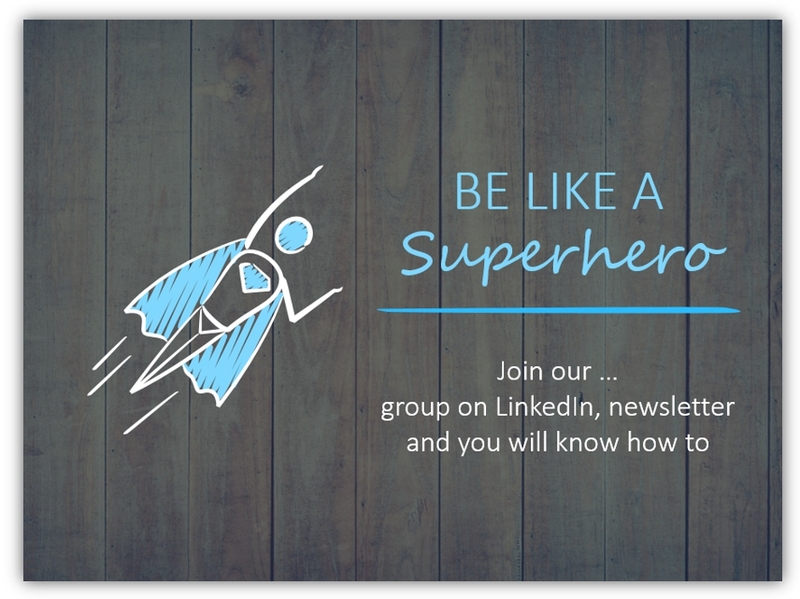 In this post, we’ll show how you can facelift your slides and show the audience something they will not forget. If you want to be different and personal within your speech, consider using hand-drawn style instead of a classical formal presentation look. Resources: All slide below are available as editable PPT from Creative Company Presentation Scribbled Deck for commercial use. Scroll down for examples of slide images. However, if you prefer a decent formal style, then have a look at this blog. 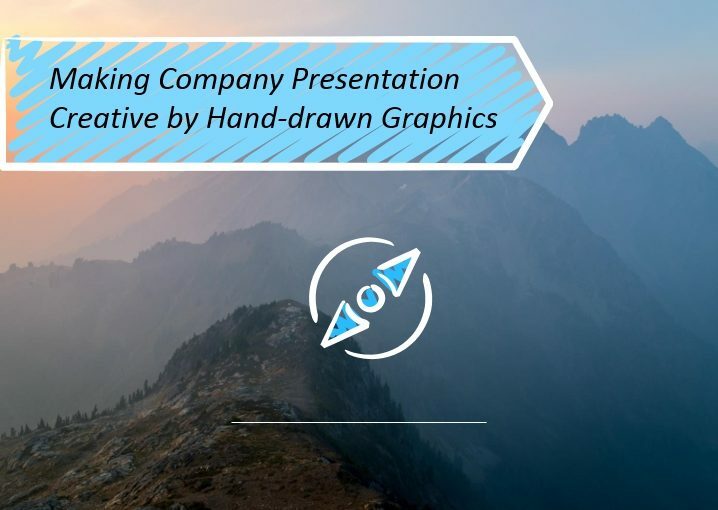 To inspire you how to present your business in an unusual hand-drawn way, we collected a few ideas from presentations we’ve seen and helped to design. This is a result of our experience put together with our handmade slide graphics. Your title slide should be catchy. They say the first 10 seconds make the main impression of a person. Unique title slide can help you with that. We advise to chose a simple picture for the background, that won’t distract people from the important – your company presentation topic. If you have a long talk with several sub-topics, then you can introduce its structure. Let people know what they can expect. Quickly go over the agenda and list the main topics you’ll cover. Using sketched lines and arrows can nicely facelift a classical bullet-point list. When presenting what you do, avoid too general mission and vision statements. Such abstract content makes the audience yawn. 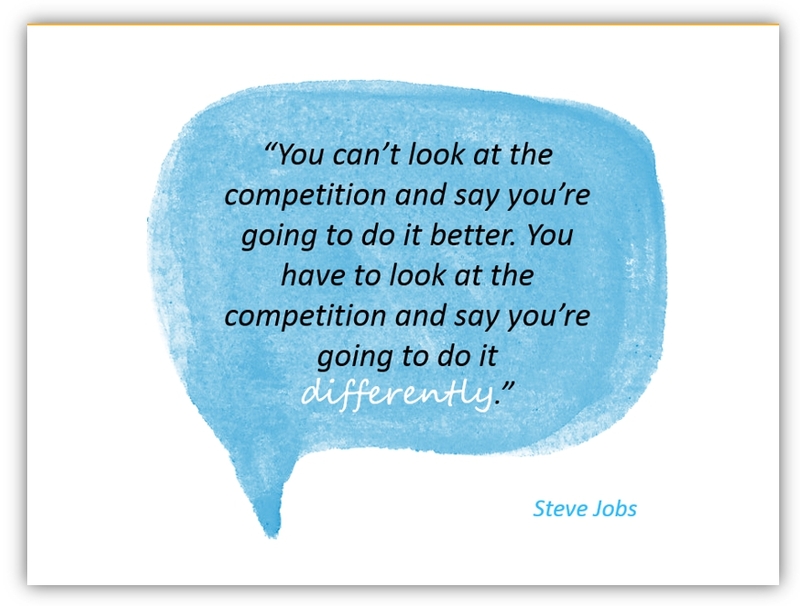 You can follow another way – open your talk with some catchy quote related to your business. It can be some famous person citation or a client quote that will resonate with people in a room. Place the quotation in the watercolor speech bubble like the one below, to keep the personal touch. Here you can find more ideas on how to design a quote slide. Again, this is something people leave for the middle or even end of the presentation. However, talking figures will make an image for your company in the eyes of the audience as data speaks for itself. For your listeners, such information is a little more important, than your dream vision (we have no doubt it’s awesome 🙂 ). After those openings, your audience is likely to be hooked on your topic. It’s time to present why you and your solution is beneficial for them. 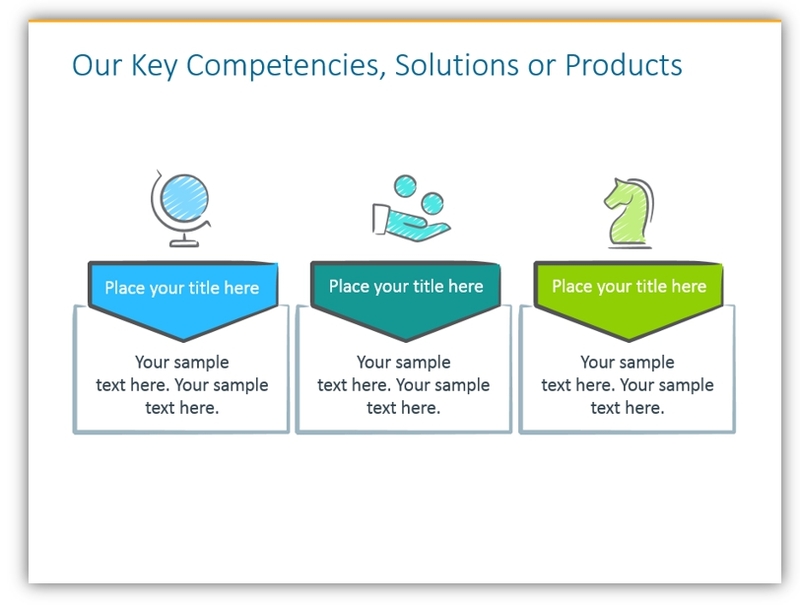 Summarize your products, competencies and solutions you offer. 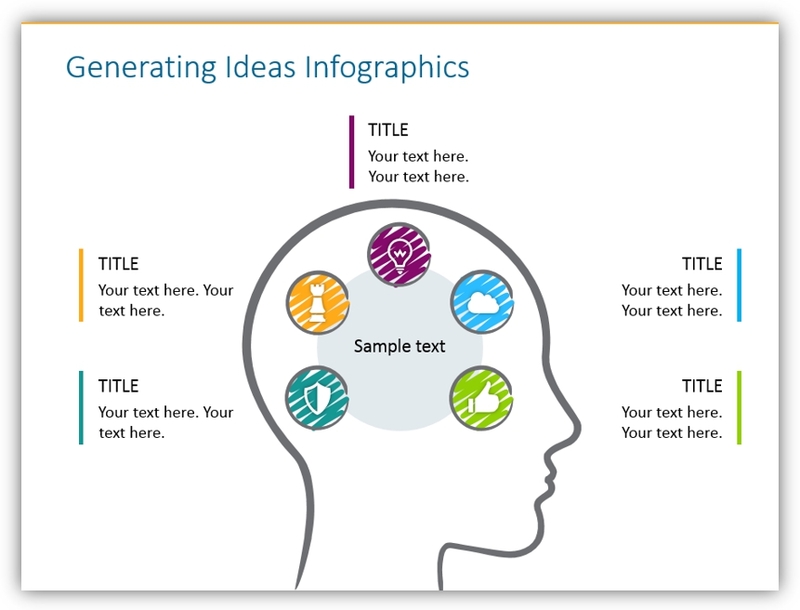 We recommend putting only keywords on a slide and don’t overload it with details. Three is a good number of items to present on a slide. People tend to remember 3-5 major points from a topic. Design-wise, you can use such tree vertical columns, each associated with a scribble icon representing the feature. Here it can be a globe for global company presence, a hand with coins for monetization or savings and chess figure for a long-term focus or a strategy. Check the Hand-Drawn PowerPoint Icons Collection for more scribble symbols and diagrams. if the order is important, use a numbered list (extend it if needed, by duplicating the rows), as below. if the completeness of your list is more important, use some circular diagram, like this pentagon chart below. 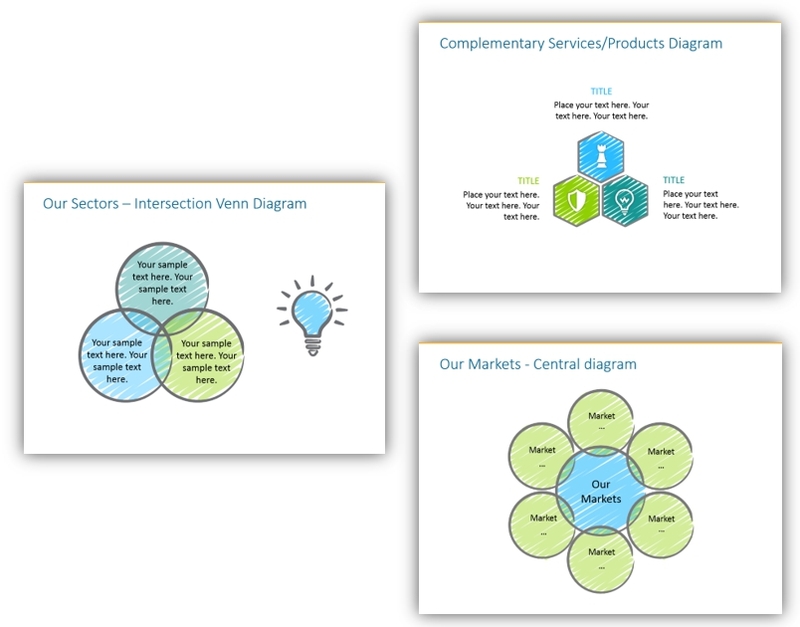 Another diagram structures you can use, to present business sectors overlap, complementary products and services, or markets list. Having such visual support for your speech will benefit your listeners – it’ll be easier for them to stay on track. People love stories. Storytelling is a very powerful tool. The history of your company can be a nice introduction to the next steps you’re planning to take. 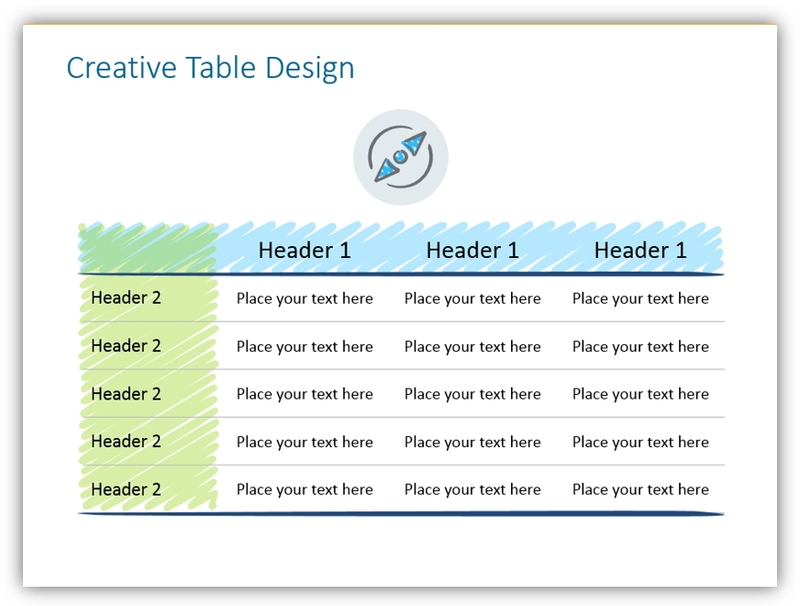 See this article for more hints on how to use storytelling in a slide design. I also recommend a book by Nancy Duarte – Resonate, where she analyses the power of stories in the famous speeches. 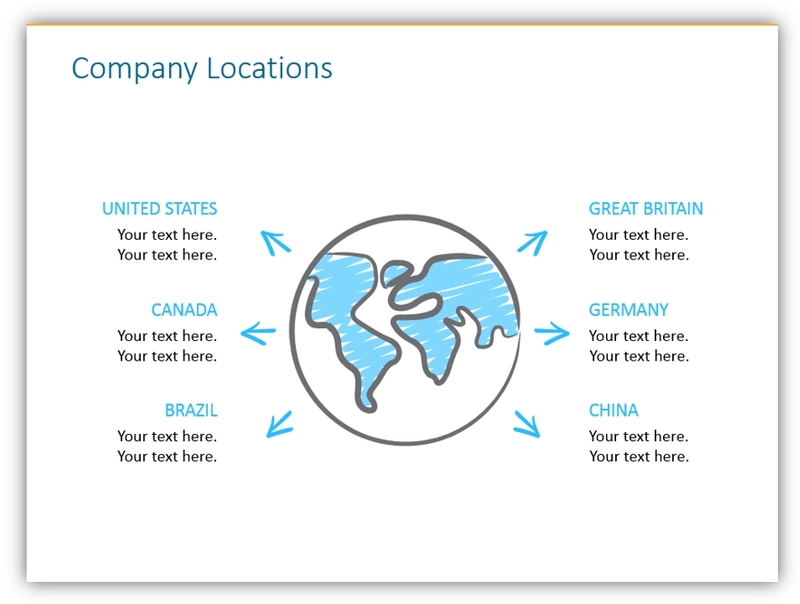 If you need to tell where your company’s offices are, we propose such a symbolic illustration of a globe. If you want to be more specific, see our maps collection. Companies and products are made by people (until it will be some AI 🙂 one day). Therefore introduce people who are behind your business. Show you are a bunch of real persons, with expertise in your field. 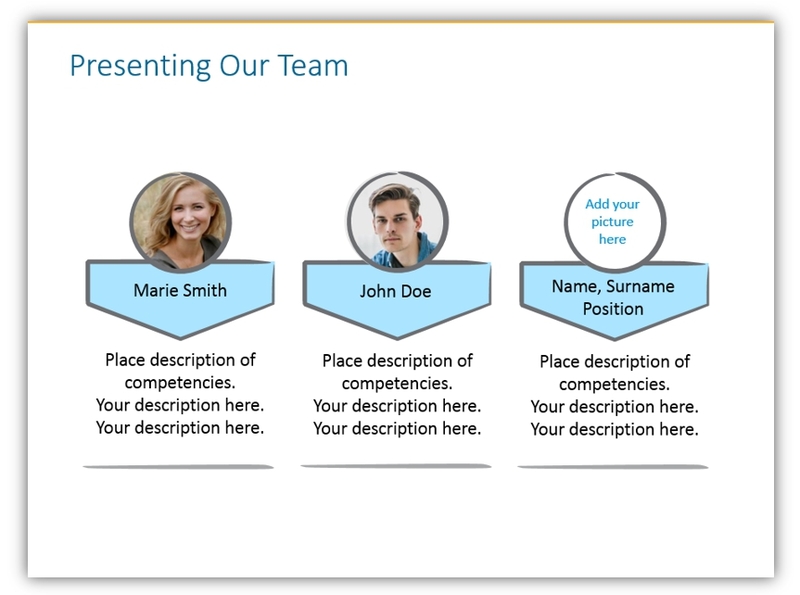 If you are in consulting or service business, presenting a project team is an even more essential. So the potential client will know who will serve them. This may not be needed for product presentations, but you maybe pitching to an investor to fund-raise a new capital. Or you will want to present your company on a job fair to get fresh employees. In such cases you will likely want to draw your long-term mission and vision, to explain company values and culture. As those can be abstract topics, make it concise on a slide. 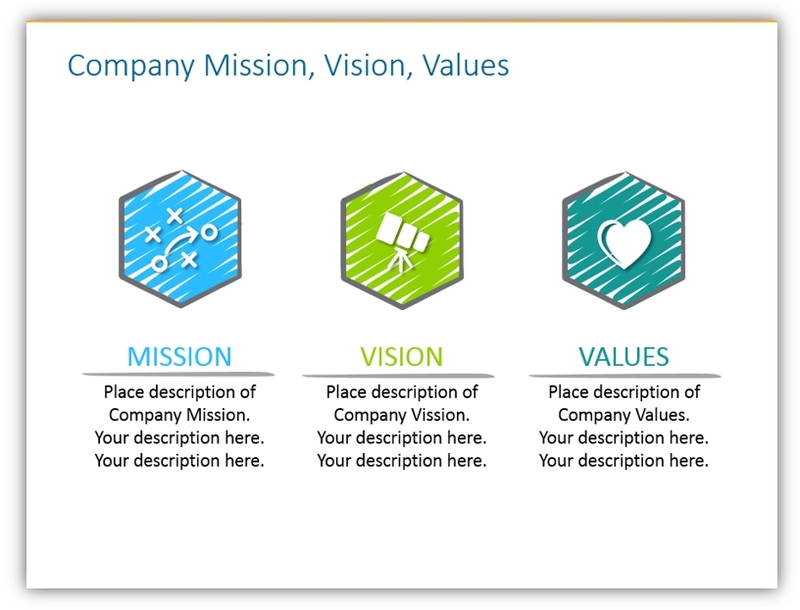 Use the slide template shown below to present your business mission, Vision and values in one compact format. 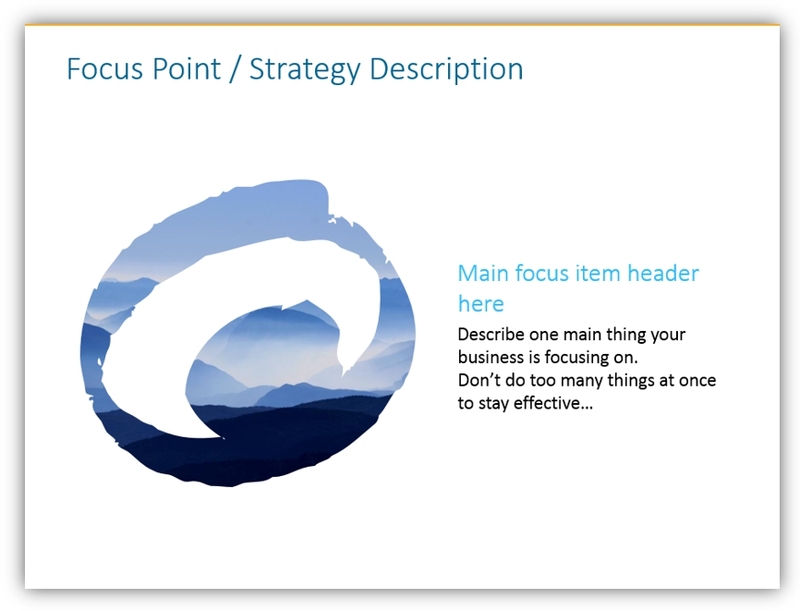 See other examples of how you can design mission and vision slide. At the end of your slideshow, it’s the time to close it. To empower all attention you got by your speech, make a strong ending. Don’t let people go away after your talk without a clear action to do as the next step. It’d be waste of your and their time. 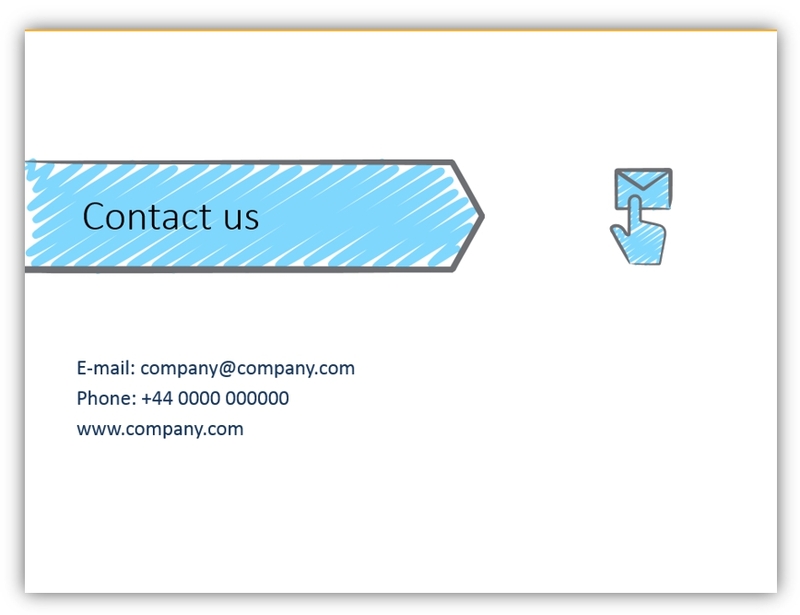 Instead of boring ‘contact us by…’, use a creative and eye-catchy slide to pass your final message or action call. comparison tables: if you want to show the difference between your old and new products or your company product and competitors. 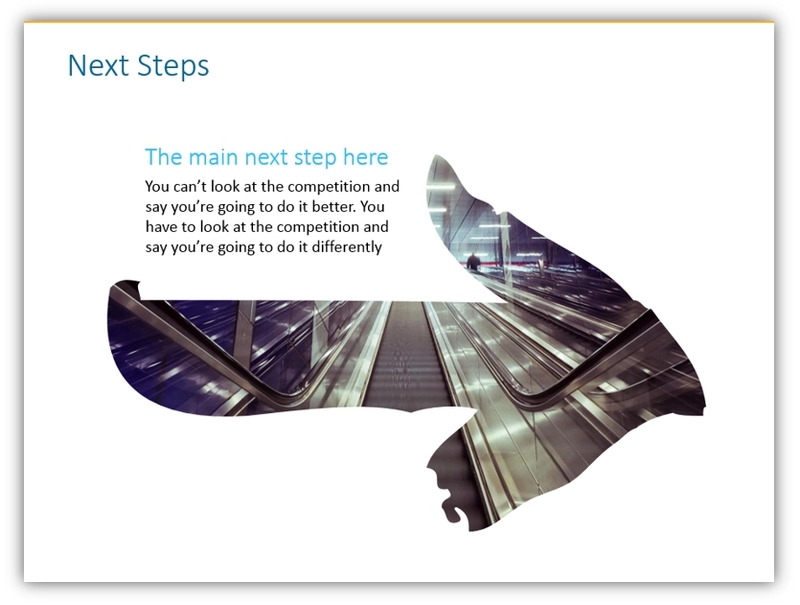 transition slides: you may need a pause between the parts of the presentation. Here are a few variants of such slides. 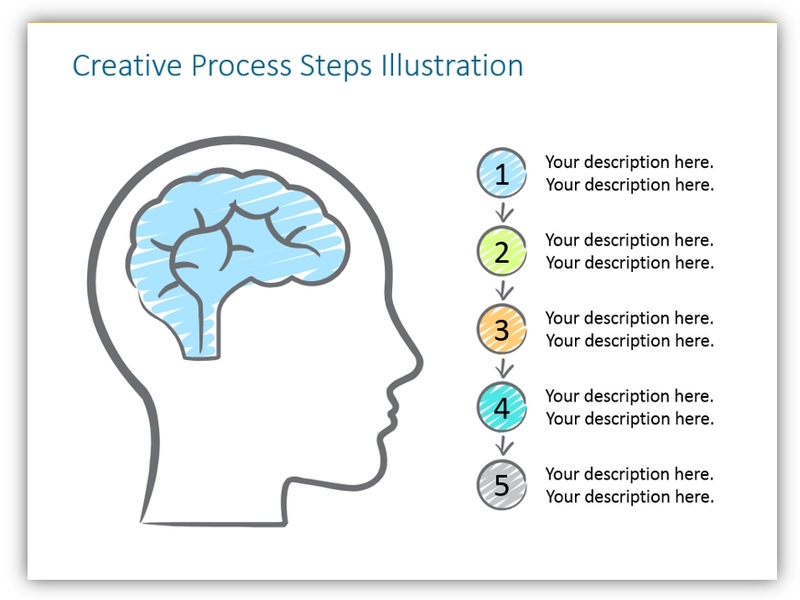 process steps illustration: use it if you want to describe the general/specific process or the project flow. These were our ideas on how you can illustrate the main parts of a creative company presentation. 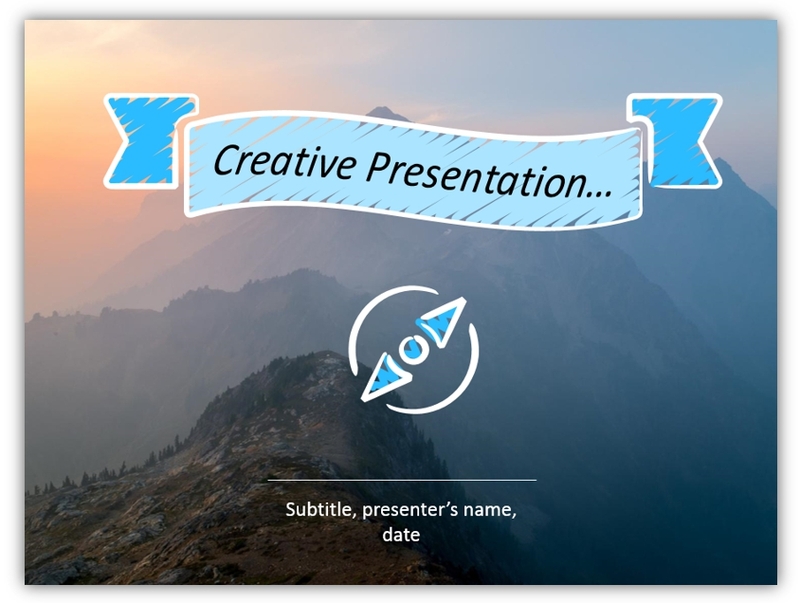 If you like the slides, we have them already pre-designed and you can easily edit them or change colors if you need. If you need to present more detailed business or market analysis, see our Business & Marketing section, where you’ll find diagrams starting from the SWOT model to HR topics illustration.